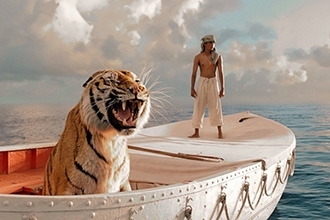 What you’ve heard about this movie is true: it’s the tale of a boy who winds up in a lifeboat in the Pacific with a Bengal tiger. It’s also true that most critics have praised The Life of Pi. I’m with them; this is a magical film. Pi Patel livess an idyllic childhood in Pondicherry, India. His father owns a zoo, and Pi develops a love for the animals as well as a spirituality that embraces the Hindu gods, Jesus, and Allah. As he tries to practice all three faiths, his father, convinced of the supremacy of reason, warns that “If you believe in everything, you will end up not believing in anything at all.” Pi’s father also demonstrates graphically that tigers are not your friend, a lesson that shakes Pi’s trust in nature. The real blow falls after economic hardship forces Pi’s family to relinquish the zoo. They sail for Canada with all the animals on a freighter, but a storm sinks the vessel, and Pi is the only human to survive. What god do you pray to and what do say when your way of life and your family are suddenly gone, and you’re alone in a lifeboat with a zebra, an orangutan, a hyena, and a tiger named Richard Parker? Initially, there is little time for prayer in the struggle to survive. Soon it’s just Richard Parker and Pi. There are cans of water and boxes of biscuits for 30 aboard the lifeboat, as well as a book on survival and a pencil that Pi uses to journal in the margins. An optimist, Pi’s spirituality returns with expressions of gratitude and surrender as the ocean moves through her various phases, with deadly storms, cornucopias of fish and rain, and scenes of unearthly beauty. Einstein once said the only important question is whether or not the universe is a friendly place. The adult Pi, who narrates the tale, believes it is. Was his ocean a friendly place or not? Both and neither, his story seems to say; it’s far more vast than that. The western fantasy of objective truth leads us to believe there are true stories and false ones. The eastern view, shared at least in part by novelists and movie makers, is that our stories create our realities. What does your heart say? What does it lead you to believe? That’s the question the grown-up Pi seems to asks us with his story and a half smile on his face. It’s the same enigma the ocean and Robert Parker put to him. 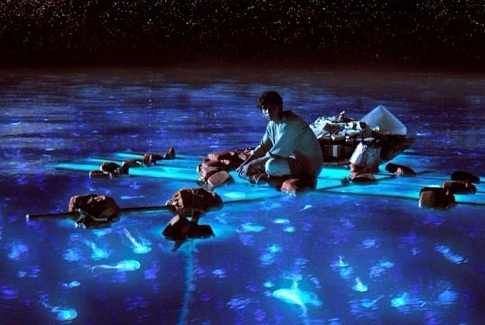 This entry was posted in Animals, Movies, Nature, Spirituality, Sports and tagged Animals, movies, Nature, spirituality, stories, The Life of Pi. Bookmark the permalink. Nicely written, concise, thought-provoking review. As an objective realist and Ayn Rand reader who once read or engaged in Paramahansa Yogananda, Guru Maharaji, Carlos Casteneda, and est I’m curious to see this movie. Without sacrificing a gripping story, the movie left me with things to think over, so I think you’ll enjoy it. I tried to read the book once a long time ago, but never got into it or things intervened or whatever. I think I will try to see the movie, then think about reading the book. Thanks for the review. I’m thinking of reading the book now too.